The breakfast included in the tariff at the Inn at Ellis Square offered coffee, juice, cereal, fruit, waffles (make them yourself), potato, sausages, eggs, and a variety of donuts and pastries. There was no way we wanted or needed all of that but we had waffles with syrup, tried the potato and sausage, and drank juice and coffee. I also managed a banana. That done we were out of the hotel and on the road shortly after 8:30 am. 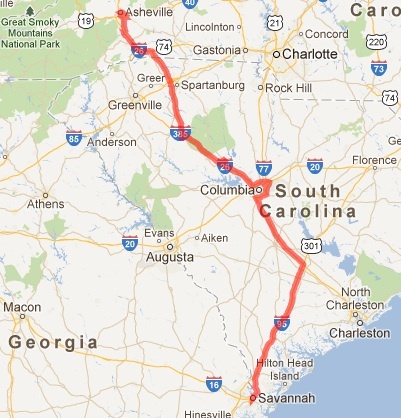 Today was always expected to be mainly about getting from S (Savannah) to A (Asheville) with the chance that we might find something interesting to do along the way but no specific plans for that. Our GPS indicated about 500 km to travel and an ETA of about 1:30 pm. That was earlier than we needed to be there so we had time to dawdle if we chose. Majella had been wanting to buy more thread and fabric for her patchwork for a day or more so a bit more than 2 hours up the road we decided to try for a shopping mall at Columbia. I consulted the GPS and selected a mall from the POIs. That took us on the ring road around the city and as we turned off to head into the mall we spotted a collection of outlets stores and a Walmart. That was enough for Majella and while she shopped for fabric and thread I hunted down the splash pad that Hannah had seen in an online catalogue and wanted for Claire. Majella had driven to that point so we changed and I went just up the road to get fuel. While I did that Majella managed to call the toll people about the toll we missed at Dulles. After some discussion she was told that they had 3 violations recored for that licence plate. She disavowed all but one but then heard that their equipment had malfunctioned on that day and they were wiping those violations in any case. We were in the clear on that one. We bought coffee and hot chocolate and a snack from the service station, dealt with a guy asking for a couple of bucks for fuel (noting that even with money his plastic fuel can did not seem to acquire fuel, and then drove on. Along the way to Asheville I spotted a sign advertising an antique mall. Majella has a hankering for a proper decoy duck from such a place so we took the exit to look. We never did find the antiques but had a drive in the country past some roadwork, through Pomaria, and eventually made it back to the highway. We pulled off again at Clinton which advertised itself as having an historic downtown, as it seems every town does in this part of the world. This time we did find some antiques but nothing Majella wanted to buy. We ate some cherries and drove on. As we neared Asheville I spotted a billboard advertising a Foam and Fabric Outlet. Majella vacillated for a bit but eventually decided to take a look and bought some fabric and needles. That took us some distance from the highway through the township of Fletcher, so the GPS took us most of the rest of the way to Asheville on back roads. We found the Ramada without difficulty and checked in about 3:30 pm. That left time for us to explore the Biltmore Estate, home of the Vanderbilts. The advertised packages are all-inclusive tickets that cover the house, gardens and other sights, and the materials suggest that you need at least a day and preferably two. My reason for coming to Asheville was the Great Smoky Mountains, the Cherokee heritage, and access to the Blue Ridge Parkway. The first two are for tomorrow and the third for Friday as we drive toward Kentucky. We didn’t have a day for Biltmore so we drove to the visitor centre, watch part of the explanatory movie, and walked around Biltmore Village where Majella found some yarn and a Christmas ornament to buy. We did not actually see Biltmore mansion, though the tree-lned drive was very impressive and we imagine the house must be the inspiration for the buildings in the local area. They were certainly impressive and in a faux historical style. Even the local McDonalds and Hardees shops were dressed up ti match rather than in their usual style. From there we drove to the downtown area of Asheville to find dinner. It was a very well presented city with classic buildings and extensive plantings in the streets. It was after 6:00 pm and pleasantly cool so we ate outside at Carmel’s Restaurant and Bar. We shared fried green tomatoes and a pulled pork pizza – both variations on traditional food of the region. I had beer and Majella had a Dirty Girl Scout. Though she had driven us into town we decided that it was best I drove home. Driving today was about 550 km. Tomorrow will involve less driving but probably a lot more walking.